NOTE: Fiesta Fridays is a special series to highlight the many memories I have of Fiesta through the photographs I’ve taken since 2003. 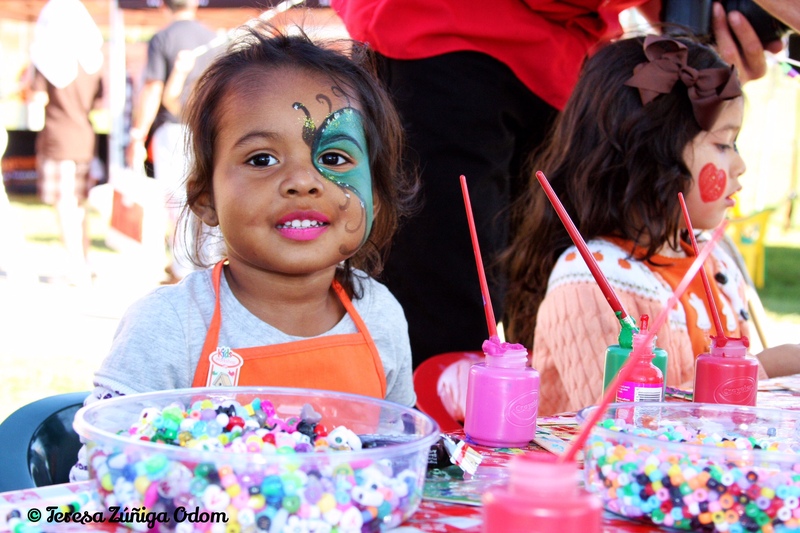 This is probably my favorite photo from Fiesta 2011…this little girl was enjoying the Family village face painting and Home Depot activities! Fiesta 2011 was one for the record books! When I think back on this particular year, there was so much going on and also a bit of turmoil. Turmoil…that’s not a word you would normally associate with a festival, but in this particular year, we had a bit of that with the creation of the state’s anti-illegal immigration bill called HB 56. This law went into effect the week of Fiesta, so naturally the board and committee members were concerned. We didn’t want trouble for our event nor did we want people to target us for any negative reason. I mean, we are a cultural festival…we don’t have a political agenda. We’ve made that clear from day one of our event. But the reality is when you have a bill such as this and a Hispanic event about to take place, the natural inclination was to be targeted by the press to get a comment or two about the situation. Usually an event works hard to get the media to cove them because you never know if a breaking new story will divert their attention. Well, in this case we didn’t have to hustle a bit! All the networks came out and I remember vividly having 3 to 4 microphones pushed in my face asking me questions about the bill and how we felt about it. I had my talking points down beforehand and stuck to those during the interviews. To this day, I can’t believe I was able to get through all those questions but the press was more than kind with their coverage of Fiesta that year. We are forever grateful for that! In fact, the greater community came out in droves to support us. We had a lot of first time patrons because they disagreed with the new law and wanted to show support in some way. They figured attending a Hispanic event was a good way to show solidarity. I had many people tell me this that day. It was so heartwarming. Keep in mind, Fiesta was created to showcase ALL Hispanic countries…not just Mexico. So this really fit into the education component of our mission. Yes, the majority of attendees are generally Mexican and the assumption is always that they are undocumented. 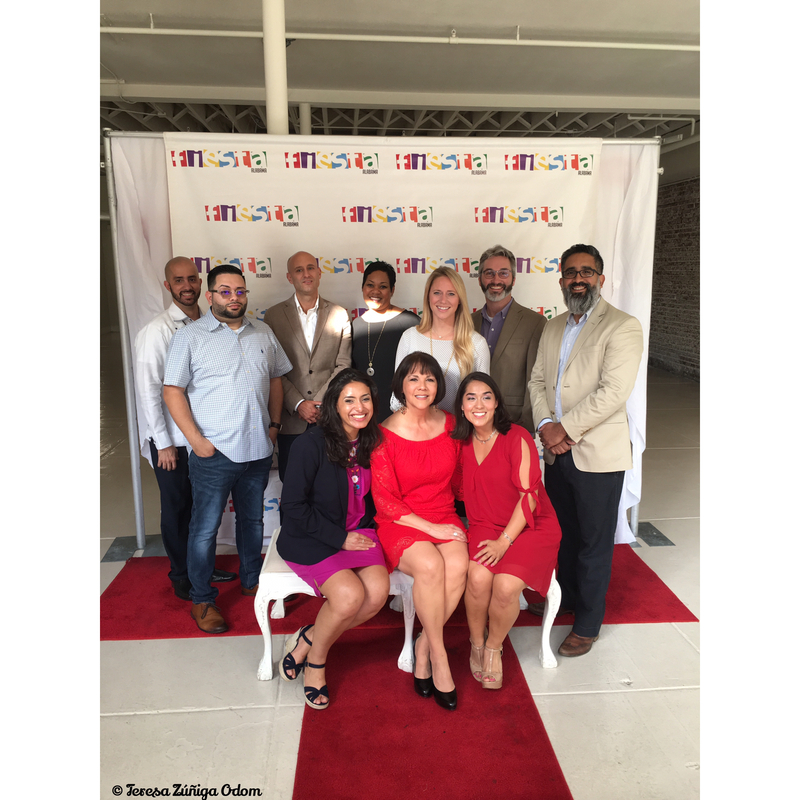 But Fiesta has always been proud of the diversity in not only attendance, but also participants of the event. We called it the largest Mexican pizza in the world! Thanks go out to the city of Hoover and our partnership with Little Caesars Pizza for making this possible! Fiesta 2011 had so much to offer that year. 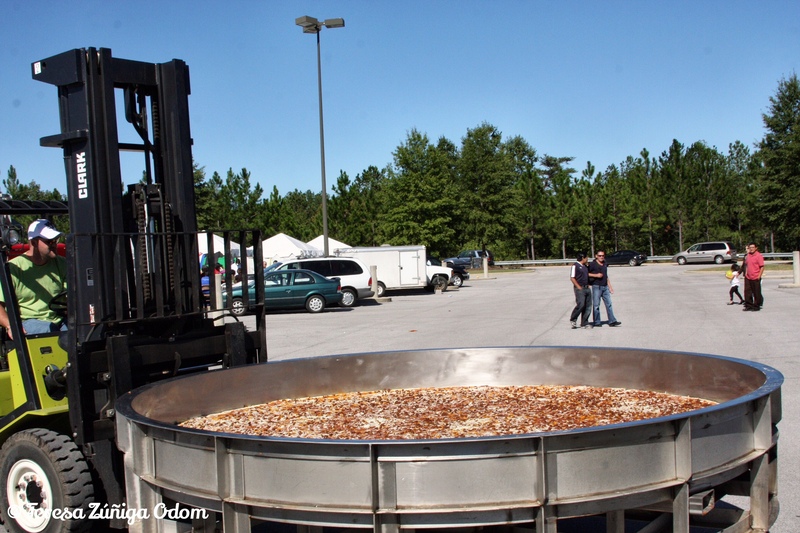 Aside from the cultural, nonprofit and family villages, we were able to create a partnership with Little Caesar’s Pizza to create what we called the “world’s largest Mexican pizza.” The City of Hoover has a giant oven that they have used at evens to bake a gigantic apple pie. We were able to get permission to use that oven and the pizza was created!!! It was amazing to see the crane bring the oven in and pull the huge pan out for the toppings to be added. I loved watching the guy crawl out on what looked like a diving board to test and see if the pizza the “done.” People gathered to watch and wait patiently to sample this savory pizza! On a personal note, my daughter Emily, completed her Girl Scout Gold Award project that year at Fiesta. She brought friends together to create a skit in English and Spanish on recycling and presented it over the afternoon for groups of families. She also handed out water bottles with information on how to recycle to children in the Family Village. The bottles were labeled “Message in a bottle/Mensaje en una botella.” In addition, she contacted Recycle Alabama to bring recycling bins to Fiesta for the first time ever. All in all, it was a very successful project and it was great to see the Family Village so active with Emily and her friends. This was a great compliment to the Home Depot army that was present once again that year! Emily happy with her Gold Award project results! Emily with the recyling haul the day after the event. We had a challenge with our musical acts that year too. As you can probably imagine, several of the music acts we had booked cancelled at the last minute due to the political climate in the state. Who could blame them…but that’s not exactly the news you want to hear right before the festival opens!!! At any rate, we were able to draw from many local acts to fill the gaps. We also had the talents of DJ Crème from New York that year who was fantastic and really stepped up with the situation facing us. The final act of the night was contacted around one o’clock that day and agreed to drive all the way from Nashville to perform for us. They were fabulous and teamed up with DJ Crème to really cap off Fiesta 2011. Nashville band rocks the crowd! Photo opp with DJ Creme! I think this was the year I realized just how many friends Fiesta has…I mean, it would have been easy to abandon our little festival due to the politics of the day. But we had so much support surrounding us that day. I know many memories were created that day. For me, this was probably the most memorable since the first Fiesta. We came through turmoil and were made better because of it all. More to come so please come back every other Friday through September 30, 2017, for more behind the scenes stories of Fiesta! This entry was posted in Fiesta, Girl Scouts, Hispanic, Hoover and tagged DJ Creme, Girl Scout Gold Award, HB 56, Hoover Met, Little Caesars Pizza, Mexican Pizza on August 11, 2017 by Southern Señora. 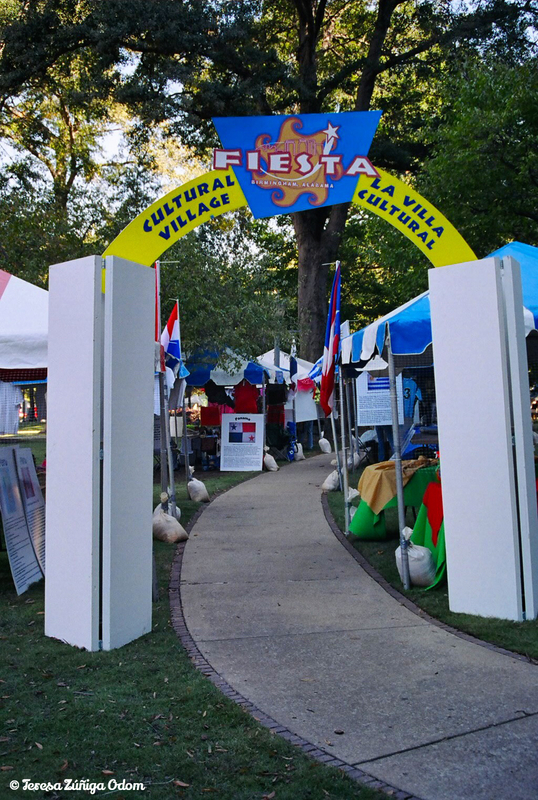 The Cultural Village entrance was used as the “official” Fiesta entrance for year 2010 at Hoover Met. Fiesta 2010 brought quite a few changes to our festival. After 2009, the board met in a strategic planning session and discussed moving the festival to another location. Hoover, Alabama came to mind because of the city’s diverse population. We were going into year 8 and the feeling was that if we were going to do something big, now was the time! 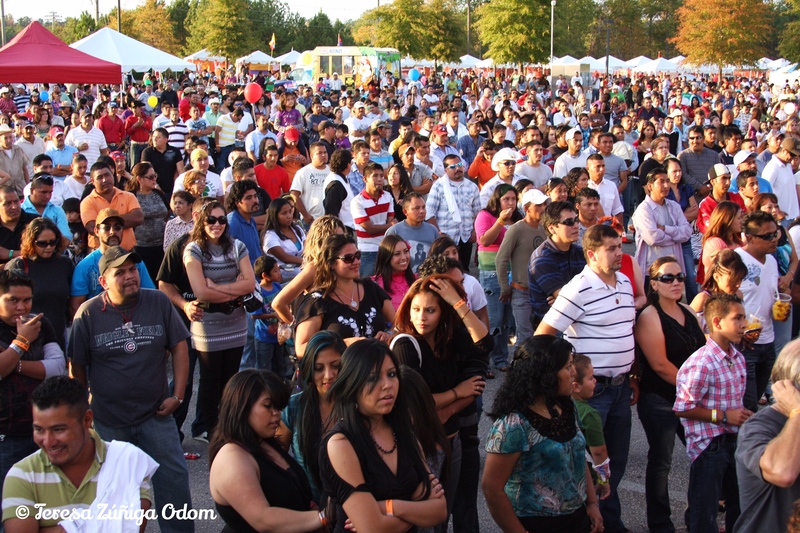 A huge crowd gathers in front of the main stage around mid-afternoon at Fiesta 2010. The move took a little time to process and recently I found a series of emails from this time period and it threw me right back into this planning period. We essentially had about 4-5 months to get Fiesta pulled together that year! Once we met with Hoover Mayor Tony Petelos and discussed our desire to mover the festival to Hoover and got his support, the actual logistics of the event were handled like clockwork. Erin Colbaugh, Hoover’s Event Coordinator, was a dream to work with and so things stayed on track in that area as our board, committees and Fiesta’s own event manager, Denise Koch, planned the festival details. Mayor Tony Petelos greets the crowd and welcomes Fiesta to Hoover! Erin Colbaugh and Mayor Petelos in discussion at Fiesta 2010. Erin is wonderful to work with and Hoover is lucky to have her! This was also the first year of our partnership with Home Depot! I remember having phone conversations with a guy by the name of Chris Miller leading up to the event – very soft spoken, laid back. Chris was organizing the Home Depot “army” for the event complete with orange aprons, children’s area crafts and a team of volunteers. One of the most awesome sights that year was the sea of orange coming from the Family area! It certainly complimented the Fiesta color scheme! I got to meet Chris that day too and a few years later, we elected him to our Fiesta Board. The rest, as they say…is history! 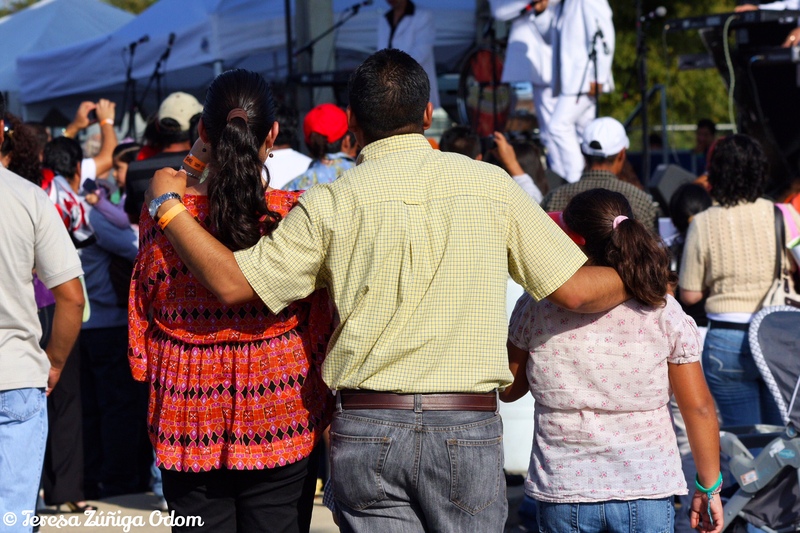 A father, mother and child enjoy the music at Fiesta 2010. This is my favorite photo from Fiesta 2010…really captures the Fiesta spirit of familia!! Probably my favorite photo from 2010 is this one (above)…a family…in front of the Coca Cola Main stage listening to the music. I don’t know…it just symbolized Fiesta for me that year…that no matter where Fiesta takes place, it’s about family and community. The community came out in full force to Fiesta in our new location and we were happy with the change that year. More to come so please come back every other Friday through September 30, 2017 for more behind the scenes stories of Fiesta! This entry was posted in Festival, Fiesta, Hoover, Photography and tagged Canon Photography, Chris Miller, Denise Koch, Erin Colbaugh, Home Depot, Hoover Met, Mayor Tony Petelos, Photography on July 28, 2017 by Southern Señora. Back when the Fiesta board was getting the festival started, we were always told the best time of year to have an event was late September through mid-October. We loved hearing this because having the event during Hispanic Heritage Month – which falls between September 15 and October 15 each year – was our plan. We were fortunate to have wonderful weather for six years in a row…and then we got to 2009…and the tables turned on us. It was SO COLD!!! To me this was a true test of our event. Would people come out to our event in the cold? Better yet, would they come out and STAY? The answer was yes and YES! You’ve heard of “fair weather friends,” – well, that year we discovered we had “all weather friends!” We had many new patrons come through, but when I look back on the photos from this particular year, I see so many friends who threw on coats, hats and gloves and came out to Fiesta despite the cold! Helen Rivas works on the Guatemala booth in the Cultural Village. Stacy and Shae get the information booth ready for the day. Ceasar Marfil prepares the Mexico booth in the Cultural Village and added this cannon! My friend Angie Vilches with her young daughter Lucia. My friend and early supporter of Fiesta – Jennifer Hatchett with her daughter, Savy, enjoy the balloon man in the Family Village. Lucia Vilchez – enjoying Fiesta despite the cold weather! This was also the year we highlighted some of the Fiesta scholarship winners by creating posters to display at the event. We really wanted to put a face on scholarships for Fiesta patrons. 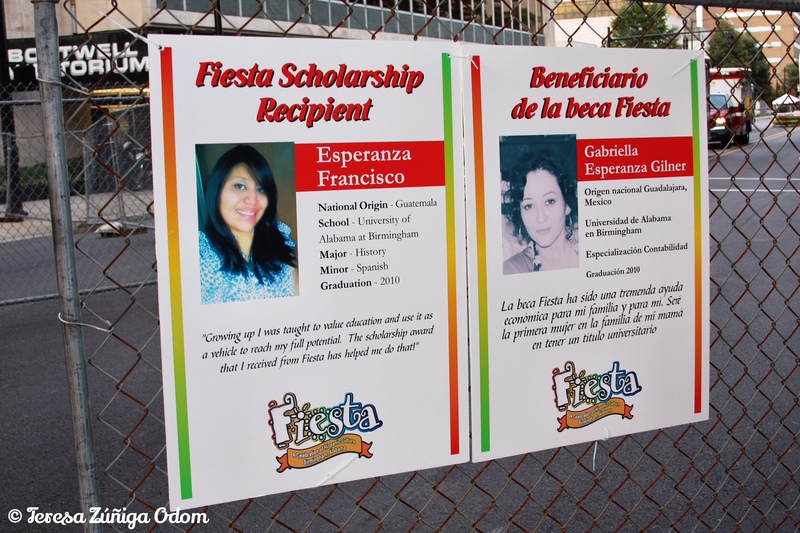 The posters contained the recipient’s photo and name, along with their major and a sentence or two about what it meant to win the Fiesta scholarship. 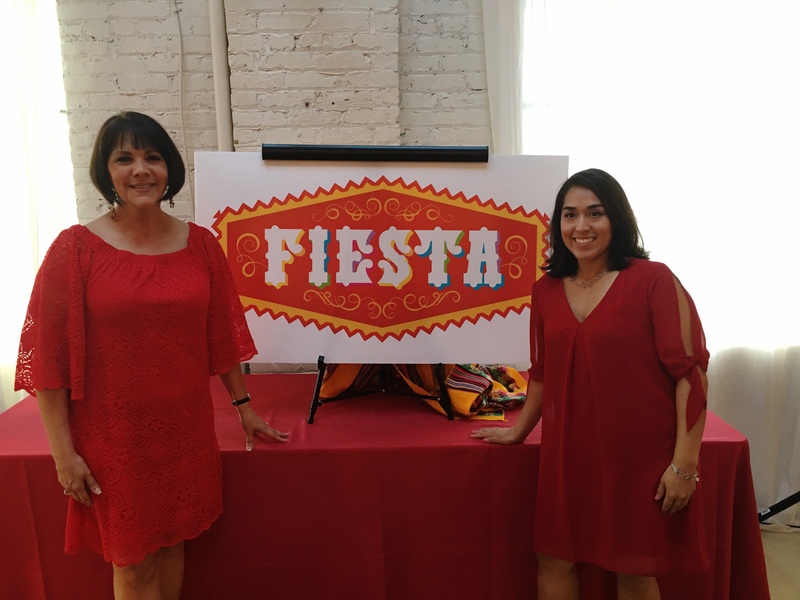 While most people who attend our event know they are coming to a Hispanic cultural festival, many don’t know about the reason Fiesta was created in the first place – to award scholarships to deserving Hispanic students who have a need in our community. The money is raised each year through the event sponsorships, donations and the admission tickets. A student volunteer prepares the scholarship posters for display. Board Member – Phil Sandoval – was in charge of monitoring the Fiesta Scholarship donation barrels. In 2008, we awarded $5K each to Samford University, University of Alabama at Birmingham and Miles College to create a Fiesta scholarship at each school. That was the largest award we had ever made in one year due to the success of Fiesta the previous years. I remember how excited the board members were to do this and we really felt as though Fiesta had arrived and reached the potential we had all hoped for in the early years. The students featured on the posters were the ones who received the 2008 awards. Many participated in Fiesta in some way and that made the awards even more special to us. This entry was posted in Festival, Fiesta, Fiesta Scholarship, Photography and tagged Canon Photography, Fiesta 2009, Fiesta Birmingham, Fiesta Scholarship, Miles College, Photography, Samford University, University of Alabama at Birmingham, Weather on July 13, 2017 by Southern Señora. Gabriela Vergara and DJ Ivan Correa get ready to dance on the Coca Cola Main Stage at Fiesta 2008. 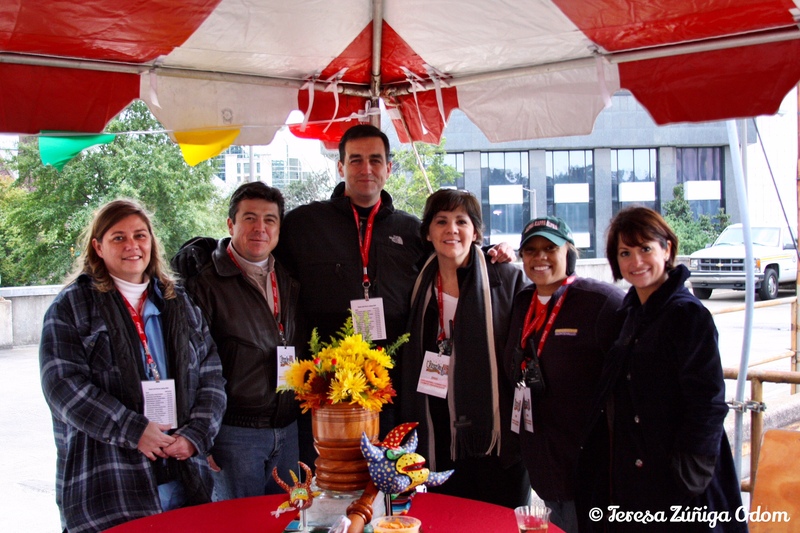 Fiesta 2008 was a beautiful sunny day, made all the more sweet by our Coca Cola Main Stage hostess, Gabriela Vergara! Elisa Gonzalez-Rubio, Fiesta board member and employee of Coca Cola, was heavily involved with the main stage acts for a number of years. She had a contact with Gabriela Vergara and brought her to Fiesta in 2006 and was able to work it out to have her at Fiesta again in 2008. Gabriella was a former Miss Venezuela and at the time, a telenovela actress and star of the Hispanic version of “Desperate Housewives.” I remember seeing her that morning as we prepared to open the event and thinking how gorgeous she was…and her personality and energy was over the top! Gabriela rocking her homemade Coca Cola t-shirt! She made it herself just minutes before appearing at Fiesta! She was staying at the Tutwiler hotel and our board member, Mike Suco – also with Coca Cola – wanted her to wear a Coca Cola t-shirt that day while she was on the main stage. Mike said she took that t-shirt, asked for a pair of scissors and turned that t-shirt into a fashion statement! I’m sure if we had taken a bunch more Coke t-shirts and started cutting away like Gabriela did with hers, we would have been able to sell them to the crowd that day! Gabriela did not stay anchored to the Main Stage that day…she was out in the crowd, getting people to dance, posing for photographs and just charming everyone who came in contact with her that day! She was front and center when Storyteller, Antonio Sacre did one of his performances in front of the stage, encouraging others to join her. She even got into the wrestling ring and got the crowd going before the matches that day. I love the photos of her interviewing a wrestler flat on his back in the ring! I mean…who would have thought to do that? One of my favorite memories is of her dancing with my friend and DJ, Ivan Correa on stage during the last act of the night. They sure looked great dancing together!!! We’ve had the great fortune to have Gabriella at Fiesta twice in our 15 years…and we would love to have her come back again one day…what do you say, Gabriella?!!! Gabriella on the main stage. Gabriella gets the crowd to stop and listen to Storyteller, Antonio Sacre. Gabriella did double duty at Fiesta 2008 by MC-ing the wrestling matches with Blue Demon and El Mexicano. Interviewing a luchador when he’s down! Gabriella was not shy about getting the interview! Gabriella and a young Mariachi girl from Texas post for a photo. Gabriella and DJ Ivan Correa close out the night on the main stage with a lively dance! One of my most favorite photos of any Fiesta! I love the colors and the movement in this photo of a Costa Rican dance group at Fiesta 2008. Early in the day we typically like to showcase dance groups and many other cultural artists. This particular year, we had a dance group from Costa Rica that performed. My memory is a little foggy on how they came to us, but the fact is, they did and they performed in front of the main stage and they were fabulous!!! I love watching traditional dancing and this group did not disappoint. Plus, their outfits were so colorful and flowy. Catching dresses in motion is a favorite of mine and I had plenty opportunity to do this during their performance. These are some of my most favorite photos of all the Fiesta events to date. Someday I’m going to figure out who they were/are. I’m convinced that I have information about them in all my archived Fiesta emails!!! This entry was posted in Festival, Fiesta, Linn Park and tagged Antonio Sacre, Canon Photography, Coca Cola Main Stage, Coca Cola T-Shirt, Costa Rica Dance Group, Fiesta 2008, Fiesta Fridays, Gabriela Vergara, Hispanic Desperate Housewives, Miss Venezuela, Photography on June 30, 2017 by Southern Señora. The Blue Demon Luchador makes his first appearance at Fiesta in 2007! Fiesta 2007 brought several new additions to the event. It was our 5th anniversary so everyone involved was so excited that we had made it this far! It also turned out to be one of our biggest years ever with over 20K people attending! I was board president that year and the board members and volunteers seemed to be settling into a great rhythm with the planning and engaging both the English and Spanish-speaking communities. This was also the year we went out on a “so-called” limb and decided the time was right for wrestling!!! Our presenting sponsor – Coca Cola – had just launched a new energy drink called Full Throttle Blue Demon and had acquired Mexican luchador (wrestler) Blue Demon, Jr. to help with promotions in Mexico. The board was having a meeting several months before our 2007 Fiesta event when we started discussing new aspects of our event. Lucha Libre was mentioned and board member, Mike Suco (with Coca Cola) brought up Blue Demon. Things took off quickly from there and before you knew it, we had Blue Demon making a weekend appearance in Alabama and we had also partnered with Wrestle Birmingham to bring a ring and local wrestlers to Fiesta! The ring was set up right next to the Coca Cola Main Stage and the crowd that gathered was incredible! I remember standing on the main stage and getting some pretty awesome photos of the wrestling matches! The crowd that gathered that year was incredible! 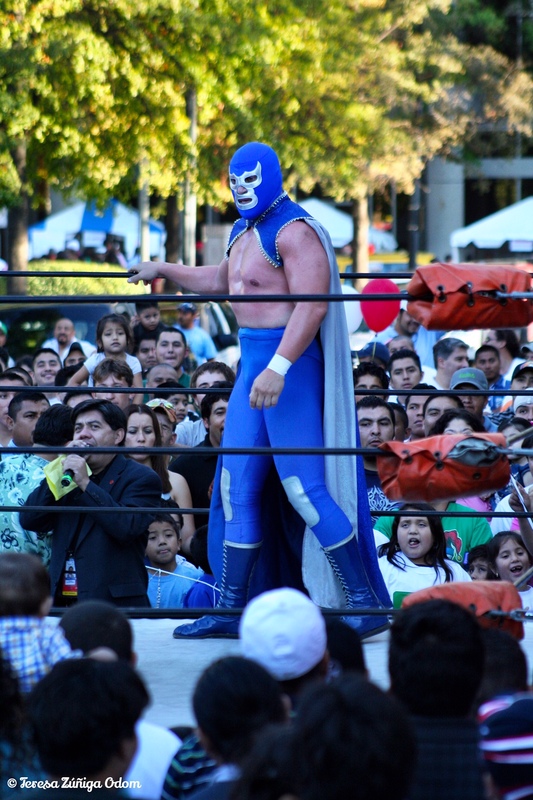 Blue Demon made a return appearance in 2008 to huge crowds. He was definitely popular! The current Fiesta board is looking at bringing wrestling or Lucha Libre, back to Fiesta for our 15th anniversary celebration. Fingers crossed it works out! I would love to see all that excitement once again at our event! 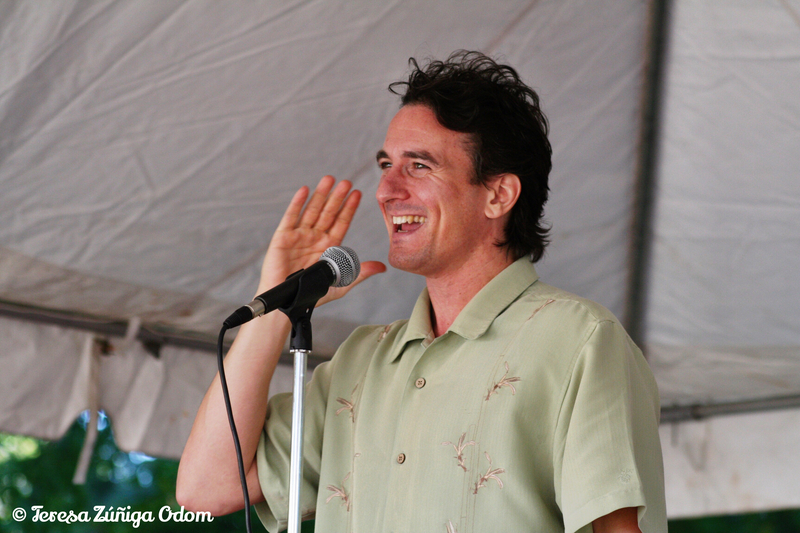 Antonio Sacre, storyteller, performer and author, makes his first appearance at Fiesta in 2007 in the Storytelling Village. Fiesta also created a new village in 2007 – the Storytelling Village. We were lucky enough to find Antonio Sacre, a storyteller, performer and author of Irish-Cuban descent to highlight the village. And let me tell you, he not only highlighted the Storytelling Village…he ended up highlighting the entire festival!!! He didn’t just stay in one part of Linn Park that day! He was all over the place, finding opportunities to tell stories in the cultural village, on the main stage and just lend his all around good nature and great stories to the delight of the many guests that day at Fiesta! No group was too small or too large for Antonio! The Storytelling Village itself was such a great set up…we had beanbag chairs for kids to relax in and hear stories read to them by UAB college students. The Birmingham Public Library also partnered with us to make this village come alive. Bilingual books were donated so kids got to read, hear the books read, and then go home with one to enjoy! Families flocked to the new village that year and seemed to really enjoy the peace and quiet offered there…away from the activity of the other areas of Fiesta but close enough to still see what was going on. Antonio Sacre made a return visit to Fiesta in 2008 and this time he came for the entire weekend. We arranged for him to visit several schools on Friday and he became quite the ambassador for Fiesta that year! I know we saw an increase in family attendance from the schools visited. I was fortunate enough to chauffeur him around that day. And on Friday night we had a reception at the Birmingham Public Library where we heard from Antonio, had a book signing and we also hosted several Fiesta scholarship winners. Our local CBS news affiliate even came out to cover the event! Welcome banner at Central Park School! The kids had all read Antonio’s book – The Barking Mouse! I have one more great memory of Antonio and the 2008 year and it is unrelated to the Fiesta event… There was a Leonardo DaVinci exhibit at the Birmingham Museum of Art that fall. The BMA had been a partner with Fiesta for many years so I had some tickets to the exhibit. We had some time before the first school visit and I asked Antonio if he wanted to go. He said “sure!” It turned out to be such a fun few hours walking around the museum with him and listening to his thoughts on the DaVinci’s drawings and other artifacts. It was such a treat for me to hear Antonio’s impressions through an artists’ mind. More to come so please come back every Friday through September 30, 2017 for more behind the scenes stories of Fiesta! This entry was posted in Festival, Fiesta, Hispanic, Linn Park and tagged 5th Anniversary, Antonio Sacre, Birmingham Museum of Art, Birmingham Public Library, Blue Demon, Central Park School, Coca-Cola, Full Throttle Blue Demon, Glen Iris School, Leonardo DaVinci, Lucha Libre, Luchador, Mike Suco, Storytelling Village, Wrestle Birmingham, Wrestling on June 23, 2017 by Southern Señora. NOTE; Fiesta Fridays is a special series to highlight the many memories I have of Fiesta through the photographs I’ve taken since 2003. 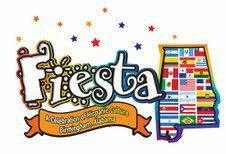 Fiesta, Alabama’s largest celebration of Hispanic culture and heritage is 15 years old this year! I’ve been spending a lot of time going through old files and photos and reliving the early years of this festival. Getting a festival like this started was a lot of work and yet those of us who were there at the beginning really didn’t know how big this event would become – or how long it would last! These photos and document revealed so much history and so many people involved for all these years. As I was reliving moment through photos, I was also recalling stories and my personal thoughts. So as we get closer to our 15th anniversary this year, I decided to begin posting a photo each Friday with a little story – I’m calling these “Fiesta Friday” photos on Facebook and Instagram. It occurred to me though that there is more to tell about some of these photos and the people involved and the best way to do this is on my blog. So this post will be about the photos I’ve already posted from 2003 to 2006. There are so many photos to choose from too! I started taking the photos at Fiesta the first year never imagining that I would become the official “unofficial” photographer of the event. I was using film and switched to digital a few years later but these are the photos that really stick out to me of the thousands that I’ve taken. Fiesta 2003 – My friends Lui Fernandez and Jasmine Reyes dance next to the Main Stage while Susan Daywood, Rei Ramos and Hernan Prado watch and enjoy the music! 2003 – Fiesta’s first year… I was at the main stage – the Coca Cola main stage and found a group of friends from the Hispanic Business Council (HBC) on the side of the stage dancing and having a great time. It was getting close to the final acts and everyone was so happy about the success of our first ever event! We had expected about 2,000 people to come through but when the numbers were finally counted, we had about 7,000 attendees our very first year! Overwhelming would be an appropriate word to describe our feelings that day. I snapped this photo of Jasmine Reyes dancing with a young man. Behind her are Susan Daywood with the City of Birmingham and a member of the HBC, Rei Ramos with the HBC and Hernan Prado, also with the HBC. What I didn’t realize at the time is that the young man Jasmine was dancing with would become a huge part of Fiesta. Luis “Lui” Fernandez is a current board member and has been instrumental in creating the “heart” of Fiesta – the Cultural Village. He took it from a few posters to a group of community members excited about portraying their respective countries and sharing this information with Fiesta guests each year. When he is in charge of something, I never worry about how it will turn out because Lui has a special talent in creating something to remember! 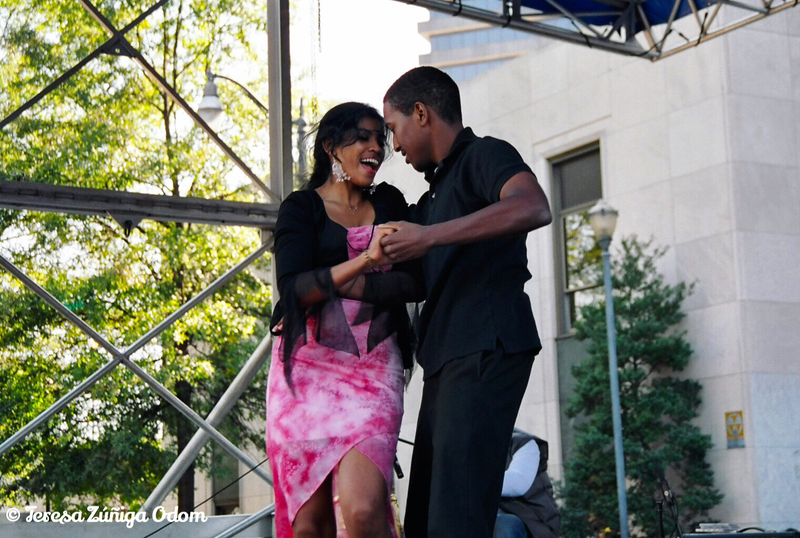 2004 -Fiesta’s second year – This photo was taken from the Coca Cola Main Stage and is of two dancers. They drew quite the crowd early in the day that year. Their dancing was on point along with the DJ playing salsa music. I was taken by the pure joy of the dance that they shared with Fiesta guests that day. This photo was used in many of the early marketing and advertising we used of Fiesta to potential sponsors and on our website. 2004 – Another photo from Fiesta’s second year is of the entrance to the Cultural Village. You’ve already read how much I admire and respect Lui Fernandez’s talent and this particular year, he decided to create an actual entrance to the village! I like to say that this was the year the Cultural Village really came to life! It was the year that music broke out all over the village and people were dancing on the sidewalk and there was always a steady crowd of people walking through to experience this community driven village. Lui created the entrance with the logo and before the event opened, he added flags from all the Hispanic countries to the white posts which made the entrance even more colorful. It was such a beautiful sight! 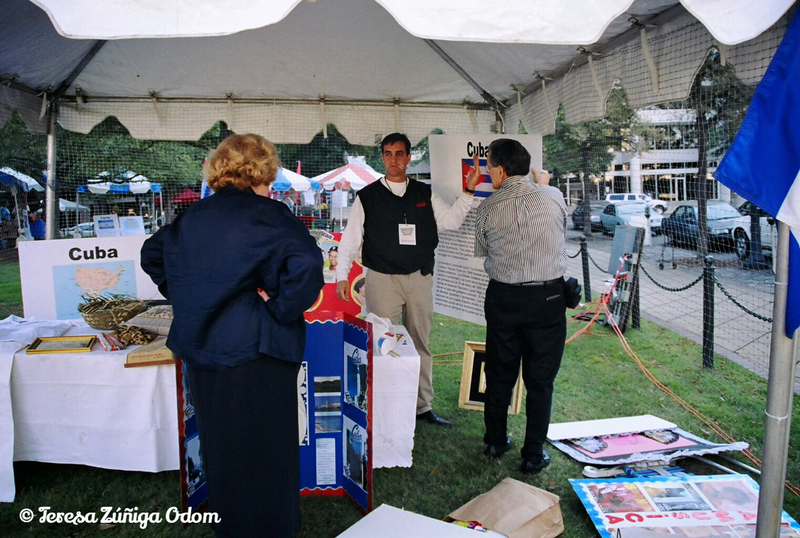 Fiesta board member – Mike Suco – helps his parents, Teresa and Ramon Suco – set up the Cuba booth in the Cultural Village in 2005. More to come so please come back every Friday through September 30, 2017! 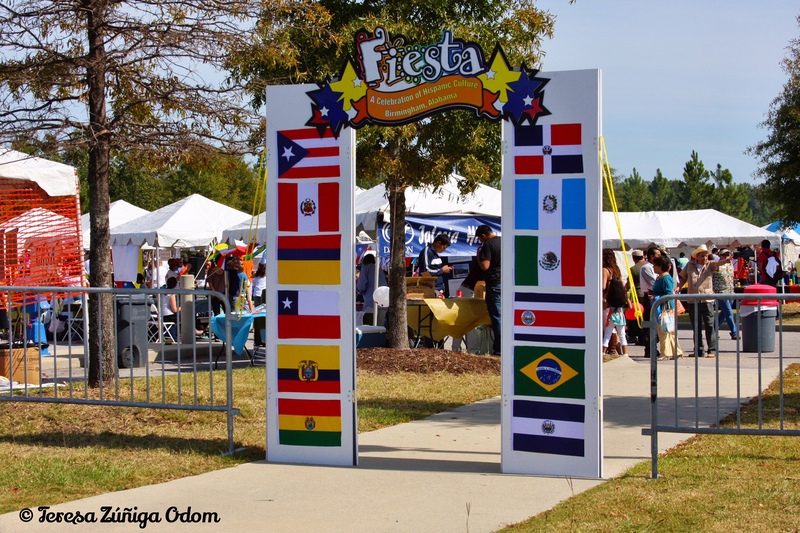 This entry was posted in Birmingham, Cultural Village, Fiesta, Hispanic, Latino, Linn Park, Photography and tagged Canon Photography, Coca Cola Main Stage, Cuba Booth, Cultural Village, Fiesta, Fiesta Birmingham, Fiesta Fridays, Lui Fernandez, Mexican Costumes, Mike Suco, Photography, Teresa and Ramon Suco on June 5, 2017 by Southern Señora. Fiesta is 15 Years Old! It’s like having a child and suddenly that child is close to adulthood and you don’t know where the time went! That’s the only way I can describe what I’m feeling now that Fiesta, Alabama’s largest festival of Hispanic culture is turning 15!!! I’ve been a part of Fiesta since the very beginning. I’ve talked about this in previous posts and this year has really been a trip down memory lane with all the plans for the festival’s quinceañera. A “quince” is a young girls’ coming of age event in Hispanic culture, much like a Sweet 16 for an American girl. So as plans were being made by the board of directors for our milestone celebration, it was decided we would refresh our logo. We did this at our 5 year and again for our 10 year anniversary so we decided fifteen was the perfect opportunity to do it again. Our first logo was done rather quickly. I would have to look back into my archives to remember who created it for us but I do remember that we wanted the Birmingham skyline to appear in the background. The graphic artist decided to put the skyline in sun design against a blue – almost turquoise background. The Fiesta word was outlined in red which really made it stand out. We were so happy with the logo. I mean, we were young (in festival years), and pretty inexperienced in running a festival so we were just so happy to have something to represent our event! Fiesa’s logo at year five with the added feature of the flags of all the Hispanic countries woven into it – the US flag is in the center! At year five, we wanted something new. We worked with a recommended graphic artist to create something that would include all Latino countries. The result, was a two layered logo – the Fiesta name with each letter in white and outlined in different colors and an additional feature of the state of Alabama with the flags of all the Hispanic countries knit together like a cultural quilt. I always loved the flag feature of this logo…so inclusive and colorful! Fast forward to our ten-year anniversary…this time we had definite thoughts and opinions about what the logo should represent. I remember meeting with the graphic artist and a few of the board members one night at Rogue Tavern. We talked about the logo and making sure that it represented as many areas of Hispanic culture as possible. The tendency with anything Hispanic is to use papel picado, Mexican hats, maracas and piñatas! These items all represent Mexico and our festival has always worked hard to dispel the idea that everyone who speaks Spanish is Mexican, so… It was imperative to make sure that other subtle aspects of Hispanic culture from around the world were featured. Year 10 logo with our “theme” for the year – Celebrando A Todo Sabor – celebrating the flavor of Fiesta. It also includes the logo around the top of our Title Sponsor – McDonalds. Board Member, Lui Fernandez, himself a graphic artist, worked closely with Sam George, recommended by Denise Koch, Fiesta’s Event Manager, to create the 10th anniversary logo. When it was unveiled, I remember thinking that the look just kept getting better and better. Lui went over the symbols represented in the logo at the unveiling and people present spoke about how meaningful it was to hear the kind of work that went into creating the logo. After the reveal though, I don’t know that we did a good job of explaining the new logo and symbolism to the community at large. I took it for granted that everyone knew. I couldn’t have been further from the truth. In fact, just last year Lui and I were at an event at the Birmingham Museum of Art with several Latino friends when he began talking about the symbolism and they said they had no idea about it all! It was a clue to us to make sure we got the word out before Fiesta about what the logo meant. Lui created an English-Spanish graphic to explain it that we shared on social media. And here we are at our Quince…Fiesta hired Style Advertising to work with us to create a new logo this time. Lui and Fiesta board member, Cristina Almanza, both worked with Grant Tatum of Style Advertising to talk through what the logo should be. We wanted to be sure that the logo was an evolution of what we have had for the past 14 years. We’ve had 3 logos to date and this one should be a mature, grown up look for Fiesta. At the presentation to the board, where we were shown three options, it was unanimous as to which logo we wanted. It was an exciting and satisfying night! So, last Thursday, April 27, we gathered sponsors, family and friends who were with Fiesta since the very beginning, and revealed the new Fiesta logo. Lui went into detail about what the logo represents and Grant ran a slide show to coincide with Lui’s words. It was perfectly orchestrated and very emotional for me. As Lui finished up his presentation, he called me and my co-President, Vanessa Vargas forward to unveil the logo. Again…so many emotions were running through me during the short walk to the front of the audience to lift the cover of the logo. The first thought was how incredible it was that this festival has lasted and is celebrating 15 years! The second, as I looked at Vanessa walking up with me, was that this young woman was around 12-13 years old when we got Fiesta started and has been there each and every year in some way to support the event along with her parents, Lucero and Jairo Vargas, owners of Latino News. She is not at the helm of this festival and leading it! The third was that this was indeed a “celebration of generations” as together we (me symbolizing the mother and Vanessa symbolizing the daughter ) lifted the cover to reveal the logo to huge applause. It was also such a humbling moment…to have been a part of such a fabulous event celebrating Hispanic culture since the very beginning and to watch it evolve over the years has been such a blessing. My baby is growing up!!! Me and Vanessa, right after the logo unveiling! We both decided to wear red to match the new logo! 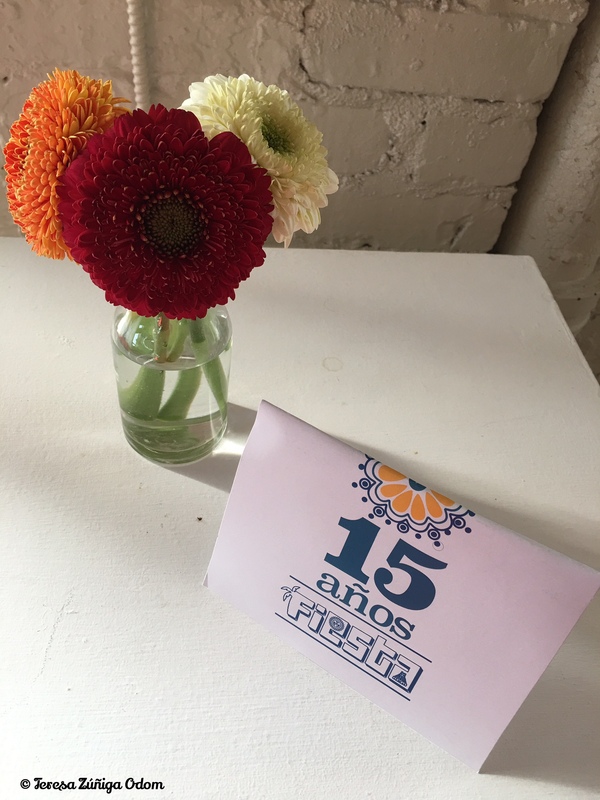 Here are a few photos from the event, including the wonderful food provided by Jose Chavez of Taqueria Mexico in Birmingham, the wonderful venue at Bridgestreet Gallery and Loft with GoPro Events and florals and decorations by our Fiesta Event Manager – Denise Koch of Denise Koch Events. We also awarded $6500 in Fiesta Scholarships at the event and those pictures are features here. A future post will talk about this in more detail. 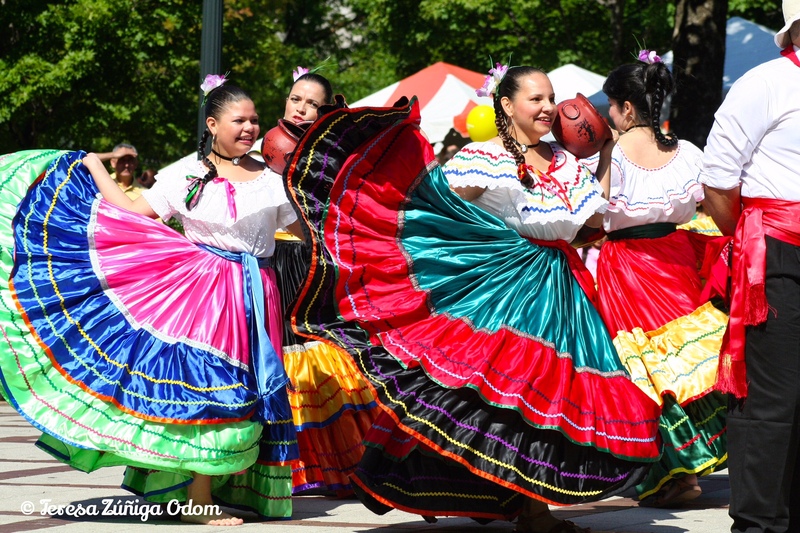 Since its inception in 2003, the Fiesta festival has served as a bridge, celebrating the culturally diverse traditions of Latin America’s various Spanish-speaking countries. As Fiesta approaches its 15th year, we have started thinking of this year’s celebration as the festival’s Quinceañero. Just as a young girl’s quince represents her transition from childhood to adulthood – we feel this milestone year is, for our festival, a bridge to a new level of maturity. It has become a tradition for our festival to introduce a new, refreshed logo every five years. As the logo evolves again for Fiesta’s quince, we wanted to take special care to help its identity continue to grow. Working with the creative team at STYLE Advertising, we’ve given careful consideration to the blending of the many pre-Columbian cultural traditions with those brought by the Spanish. As we approached this project, we poured over posters depicting 20th century air travel, bull fighting and wrestling, album covers for salsa, bosa nova and tango, as well as depictions of Taino, Aztec, Mayan and Incan art and architecture. Our vision was for each of these aspects to come together and communicate a Celebration of Generations, the theme for this year’s Fiesta. Latin America’s rich and varied graphic and typographic heritage was also influential and inspirational in developing Fiesta’s new logo. The typeface we chose radiates a playful exuberance. It is a woodtype-styled, decorative face that has characteristics reminiscent of the cut-stone glyphs of the Incas, Mayans and Aztecs, while also remaining evocative of traditional, ornamental Spanish design. In addition to our careful, typographic considerations, color proved another significant design element to incorporate. The predominant, rich red serves as a background that unifies the new mark. It is the red found in a matador’s cape, the dresses of tango and flamenco dancers and the traditional costumes of many indigenous peoples. The vibrant red is also a significant color for festivals like Carnival de Barranquilla, Oruro Bolivia, and Ponce Puerto Rico, uniting Fiesta with other Latin American festivals while still maintaining its own unique identity. 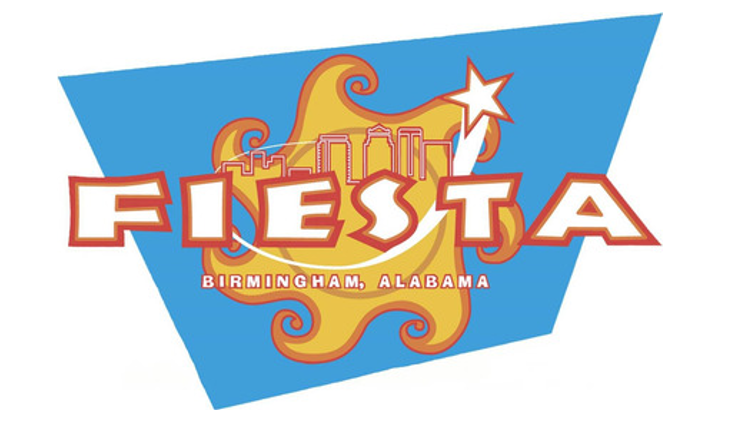 In order to give the Fiesta logotype depth and vibrancy in addition to its rich, red background, we also incorporated the lively, multi-colored palate used in previous versions of the Fiesta logo. These vivid colors are found in Mexican picados, traditional textiles from the Andes and painted building facades from the Caribbean to Argentina. As a nod to previous logos, in which each letter was adorned in a different color, we have added multi-colored shadows behind each letter. These colorful shadows give the logo depth, striking a balance between the playfulness of youthful logos of the past and a new simplicity and maturity that we have sought to capture with this new logo in honor of Fiesta’s quince. Lastly are the graphic motifs found within the mark and as the emblem’s border. Surrounding the logotype are swirls of scroll work, both fluid and feminine, mimicking the movement of dance. Additionally, these ornaments represent the flourish of baroque Spanish metalcraft. Around the emblem zigzags an angular line, countering the feminine swirls with a strong masculine identity. It speaks of native textile designs, Afro-Latin art and the architectural accomplishments of the pre-Colombian empires. We feel that this dynamic, new logo sings with the harmony of both old and new, representing Fiesta’s storied history while allowing for growth and maturity as we embark on the next five, ten and even 15 years. The logo does represent change, however it does so without forgetting the elements of Fiesta that have made and continue to make the festival great. We hope that you will feel ownership in this new logo as you recognize its aspects that pay tribute to previous Fiesta logos and to the history of Latin American culture as a whole, while also recognizing its progression and continually strengthened identity. We hope that each one of you, each member of our Fiesta family both new and old, will be able to see a bit of yourselves in the logo. We hope that you will be able to identify with some piece of its symbolism, both those explicitly expressed and those left unsaid, as it serves as an artistic representation of Latin America’s numerous, unique cultures and of Fiestas both past, present and future. Much of the reason we have taken so much care to create a logo that is representative of so many is because we would not be here without so many of you who have been with us from the beginning—those who continue to back us year after year. 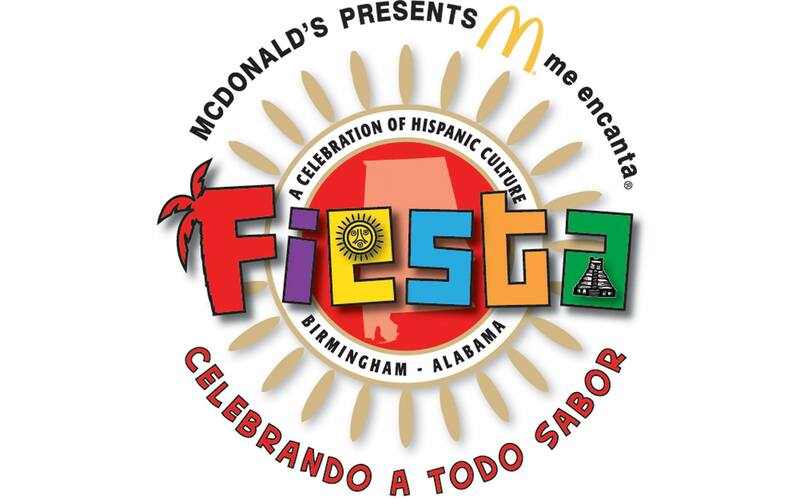 We would be remiss not to thank our dedicated sponsors like McDonalds, Coca Cola and the City of Birmingham, to whom we must attribute so many successful years of Fiesta and so much of the festival’s growth. We could not have done this without your generosity and unwavering support, and we would never have made it to Fiesta’s quince without you. From the bottom of our hearts, Gracias. Muchas, muchas gracias. This entry was posted in Anniversary, Festival, Fiesta, Hispanic, Quinceanera, Uncategorized and tagged Bridgestreet Gallery and Loft, Denise Koch Events, Fiesta 2017, Fiesta logo, Fiestabham, Foodie, GoPro Events, Grant Tatum, Graphic Design, Jose Chavez, Latino News, McDonalds, Quinceanera, Sam George, Santiago Negre, Style Advertising, Taqueria Mexico on May 5, 2017 by Southern Señora.